Over the past week I’ve been cleaning out American Kestrel nest boxes in Marion and Levy Counties. These boxes are most commonly mounted on utility poles or longleaf pine trees. Over the years, debris can pile up in nest boxes and make them nearly unusable for kestrels, especially if a squirrel has moved in. 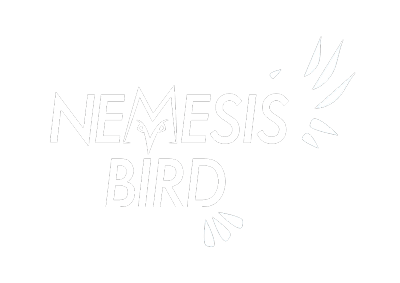 If a box has been used by kestrels, the floor is covered with a thick layer of bug parts, usually with a few pellets and feathers mixed in, and the walls are covered in white wash. If the debris isn’t too thick, we leave it, or add some wood shavings so the kestrels have somewhere to lay their eggs; they won’t bring in nesting material. Right now, pairs are starting to check out their nest boxes, and are perching very close to them. It is not uncommon to be dive-bombed by angry kestrels, but more often, the adults just sit on a powerline nearby and scream. One female sat within 10 meters of me, and waited rather impatiently for me to clean out the box. Still others sat at far distances and could have cared less that a human was investigating their nest cavity. Eggs will start being laid at the end of the month, so when I check boxes again in early March, I should start seeing them. Sometimes, other cavity-loving critters can move into nest boxes. The big roomy space is irresistible to the three kinds of squirrels you can find inFlorida; the southern flying squirrel, the eastern gray squirrel, and the fox squirrel, and all are intent on stuffing the boxes full of leaves, moss, and babies. Gray squirrels live absolutely everywhere in Florida and are extremely common. These are likely the bird seed addicts that live in your back yard; they range in color from gray to grayish brown. Fox squirrels are much less numerous, and are distinguishable from gray squirrels by their enormous size, bushy tail, and “black mask” that most adults show. There are 3 subspecies of fox squirrel inFlorida. The Big Cypress Fox Squirrel is found in the Everglades, and Sherman’s Fox squirrel is found in central Florida (where I am); both are listed as threatened. The third is found in the panhandle. Because they are threatened, we don’t mind that they take over nest boxes. Natural cavities in Florida are hard to find for all critters, so I am always glad to find the yellowish-brown bodies of baby fox squirrels in a box (although most of the time, I find gray squirrel babies!). Adult fox and gray squirrels can both be pretty defensive of their nests, and more than one time, an angry parent squirrel has stood its ground in the nest box, or run up the pole *while* I am on the ladder at their nest! While I don’t think I’d ever get attacked by a squirrel, an adult squirrel is pretty much the scariest thing to see when I open the door to a nest box. It even beats spiders and snakes. Fox squirrel sitting on nest box; refusing to leave! On the not-so-intimidating side of squirrels is the southern flying squirrel. There is no way I could ever be afraid of those huge dark eyes on that super soft-looking little body. On chilly mornings, I’ve found up to 5 flying squirrels huddled together in nest boxes, and the last thing they want to do is leave their warm bed. If they don’t have babies, I give them a little poke, and most of them scatter while I clean out the box. I am sure they jump right back into the box after I leave though, because unlike the other 2 squirrel species, they choose to run up poles and trees rather than down. 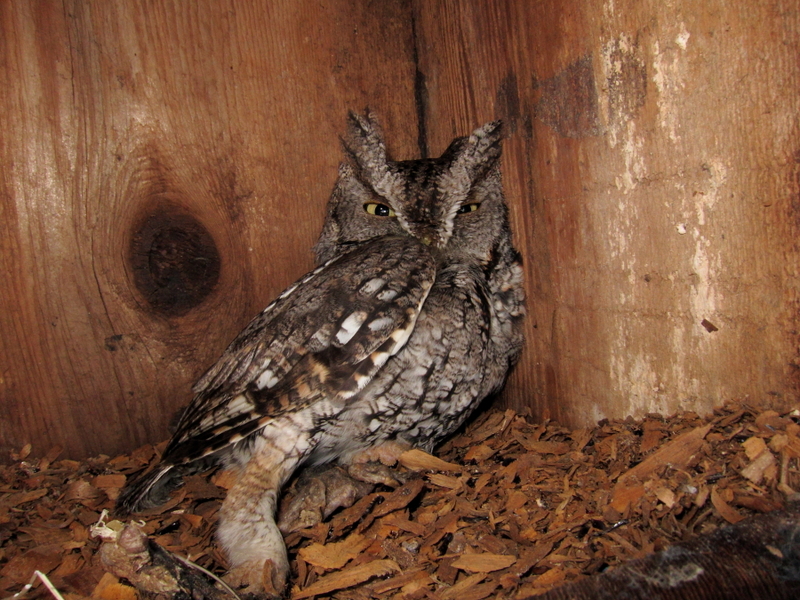 By far my favorite thing to see when I open a nest box is an Eastern Screech-Owl. Some are wide-eyed and awake and others are flat-out comatose. I haven’t found any on eggs yet, but I imagine my nest box checks in a month will reveal some. So far, I’ve encountered 4 different screech-owls. I didn’t get a good look at the first, the second two were red phase, and the third was a gray phase. 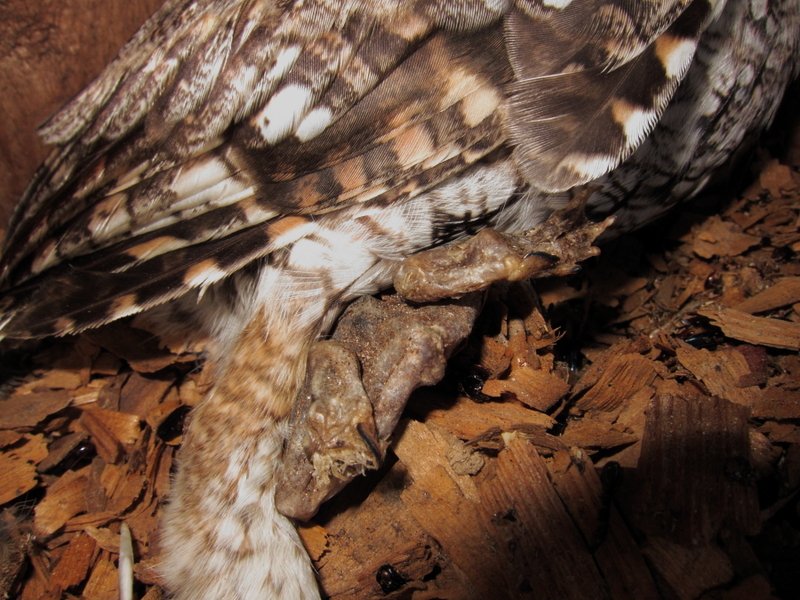 The gray phase owl was holding onto two eastern spadefoot toads! He was at first alert and active within the box, but then decided to completely shut down and go into “camo” mode, holding tightly to his spadefoots. Eastern Screech-Owl - Red phase; this owl was active and "bill-clapped"
Eastern Screech-Owl - Red phase; this owl never opened its eyes and I had to move it around to look for eggs! I also encounter many other nests made by a variety of cavity-nesting birds (think Eastern Bluebirds, Great Crested Flycatchers, European Starlings), but I’ll save that for another post!